Now for the first time, record your personal experiences and work related video in realistic stereoscopic 3-D. The Nu-View ® adapter changes your flat 2 dimensional camcorder into a camera that records rich 3-D visual worlds. Nu-View ®increases the value and extends the usefulness of the camcorder you may now own. Nu-View ® is compatible with virtually all camcorders, VCR's and television sets in all standards presently available. WORLDWIDE! By using our patent-pending process called Stereo-OptixTM , there is no longer a need to look at your new recordings on a "flat" screen. 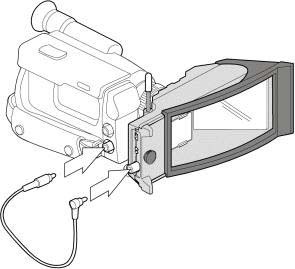 View your 3-D video recordings on any stereoscopic head mounted display system or with any video shutter glasses on both your television or VGA monitor. Imagine recording and viewing your child's first steps, vacations and all of nature's glorious sights in photo realistic 3-D.
To view 3D videos on your TV, we recommend the H3D Video Eyewear. To view 3D videos on a PC, use the Eyeforce or 3D Revelator glasses and a quality Video capture card. Alternatively, use on one of our 3D HMDs like the i-glasses 3D, i-glasses 3D SVGA or Cy-Visor 3D.